Huston-Tillotson University of Austin, Texas has nine academic departments. Not only that, but each department is bustling with students, professors, and staff, all with a passion for education and learning. To keep this massive amount of information organized and to assist them in managing such a large website, Vuepoint provided HT with a custom designed and easy to manage WordPress website. The website serves more than one purpose, so organization is key to a website of this scale. In order to appeal to future students, an attention-grabbing “Apply to HT” is prominently displayed in the header of every page. The enrollment page allows the user to apply to the university and review other important enrollment related links such as First Year Student, Transfer Student, Veterans, and the Adult Degree Program. This ensures that traditional and non-traditional students alike will be able to find the information they’re looking for. The navigation is broken into six major items with related pages displayed below each. This simple expanding navigation menu allows the user to quickly find what they are looking for in one click. Less clicks, less hassle. 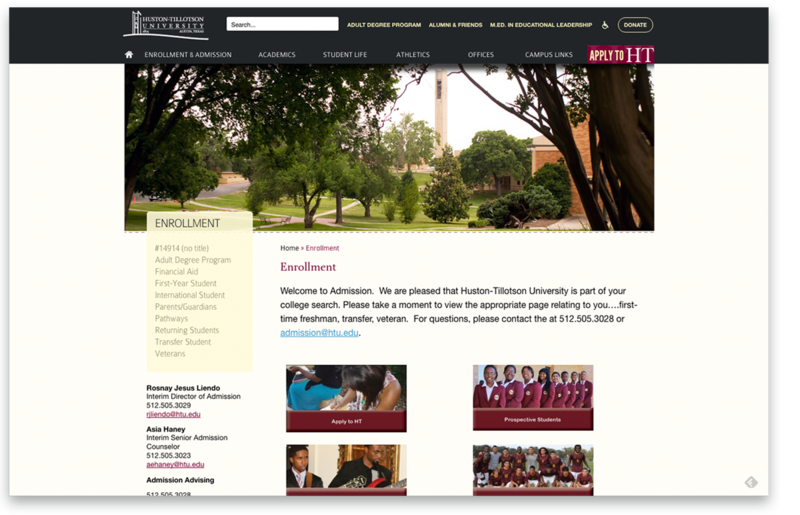 Any college or university website is a massive undertaking but with well-established goals and a clear vision from the onset, Vuepoint was able to achieve Huston-Tillotson University’s goals. With a robust website to accommodate a large amount of information and the ability to manage multiple users and their new content, this university is prepared to focus on what they do best.